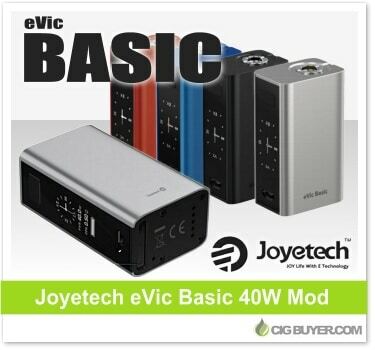 The Joyetech eVic Basic Mod comes the same V4.02 firmware as the brand new Joyetech eVic AIO, but it offers a bit less power, and rather than being an all-in-one unit you can use it with the atomizer of your choice – down to 0.05 ohms. It features a built-in 1500mAh battery and offers up to 40W of power with temperature control (Ni/Ti/SS); along with a super large OLED screen, RTC (Real Time Clock) display and micro-USB charging / upgrade port. Although it has a clean, simplistic design, the eVic Basic Mod is loaded with technology and advanced features, and it’s ideal for vapers with low to mid-range power needs. * Expiration of coupon codes is unknown. Good while supplies last.